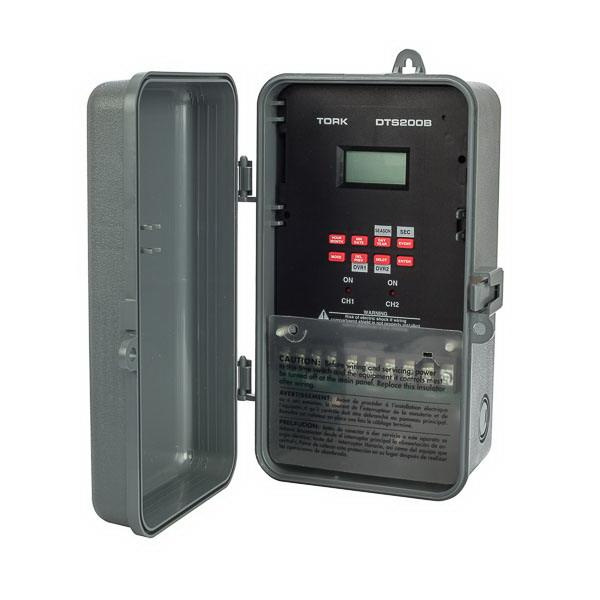 NSI Tork® 1-Pole Digital timer switch is rated at 120/208/240/277-Volt AC. It features SPDT contact configuration to provide maximum conductivity. It has contact rating of 30-Amps at 24 - 277-Volt AC. This digital timer switch with season and holiday module, accommodates wire of size 16 - 14-AWG and 16-12-AWG. It has timing range of 365 - 7 days. This 2-channel switch is suitable for use with indoor and outdoor lighting, heating and air conditioning, security systems, horns and bells, low-voltage lighting, misting and spraying, roof cooling, process functions and clock correction systems. Timer switch offers 99 ON/OFF set points for individual programs on each day of the week. Timer switch with permanent schedule retention has a super capacitor that gives seven days of real time backup. It features daylight saving automatic adjustment and LCD display for clear view. Timer switch comes with AM/PM clock format for easy time reading. This switch features NEMA 3R Noryl® enclosure with lockable hasp. It measures 5-Inch x 4.5-Inch x 9.125-Inch. It withstands temperature range of -40 to 149 deg F. Timer switch is cULus listed.